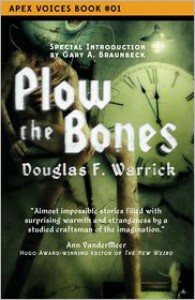 The "F" in Douglas F. Warrick tells you a lot about how this book is going to read. It was clearly written by someone who goes by Douglas, not Doug, and who would correct you if your forgot to include their middle initial in their name. A confession. This story began with a lie. This story wanted very much to end here. And so it spun a fabrication within its very second sentence. But this is not the end of this story, as ashamed as it may be to admit it. This is the rest of this story, told into the void as all stories are. Until their end. Whether they like it or not. Godawful. I get that this is a young author, and I hope his style improves in his future work. I liked some of the ideas, especially in "Zen and the Art of Gordon Dratch's Damnation" (OMG that title though). I would bet that as he matures, Warrick will gain some confidence and step away from the wrought prose and let his stories stand on their ideas. I hope. To quote from an Amazon reviewer named August, "The writing is very good. But I personally hated it." Not recommended.